Home DestinationEUROPEFrance	Nice – France on a budget. The best list of things to do budget friendly. Nice is awesome. Yes, I know, this is not the best way to open a blog post, but we fell in love for Nice. In a point, I was looking at the letting agency window for spot any good flat price. Yes, all our trip was based on a chance to move in France, on the coast, in Nice, Cote Azur. Nice is overlooking the Mediterranean Sea, it is a beautiful city and is one of the most popular tourist destinations. A lot of people do a tour in France, passing from Paris to the South, more warm and rich of beaches. All the buildings are new and classic posh. The Apartment looks exclusive and expensive. Even if you think is expensive travel, we afford Nice on a budget, and it was so easy. We didn’t take off any attraction, or we did all the most important, we traveled from Nice to Cannes and Montecarlo by bus, we drank a lot of glass of wine for feel French, and we didn’t spend a lot. Even the flight cost us less than you expect, the cost was just 10£ each go and returns. Yes, just 10£ for the travel expenses, at least we spent more on the travel from our house to the Stansted Airport, than the flight. We booked it with Ryanair, with a Travel exclusive limited offer, a few days before Christmas, also called Lucky day. We been here at the end of January and suppose to be a really colder winter, we find a beautiful sunshine when we dropped in Nice, just a few days of rain but really warm, or I mean, more worm than London. Nice is a typical two or three days trip, we will suggest you book the place where stay close to the centre, spend a little bit more but get close to the main attractions. The centre of Nice is not really big, and is completely walkable, with a commercial way really full of shops and with a big shopping centre. 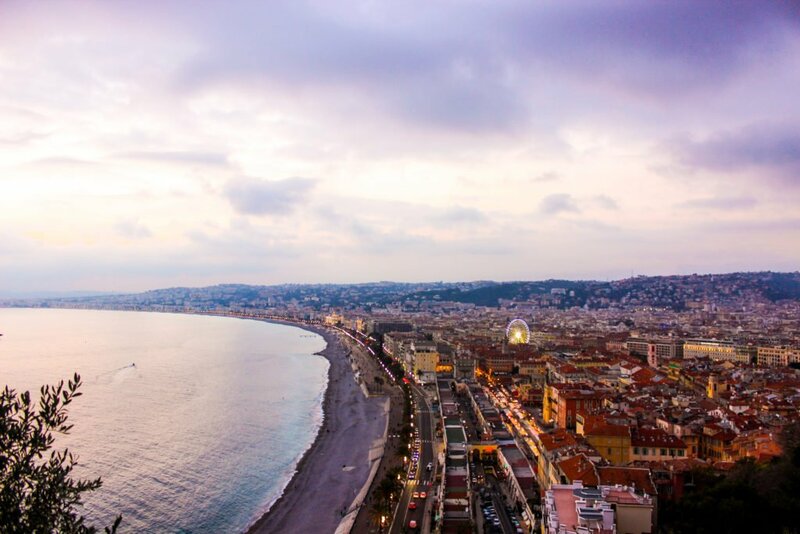 If you plan to stay in Nice, you are looking for a guide to the main attractions, even if you came on this blog, you will find suggestions for affording your travel on a budget. Here there is a list of attraction you can do budget-friendly, and come back at home with a beautiful experience in France. Check also how to spend three days in Nice. It’s the main square of the city, just down to the popular Avenue Jean Médecin, the street of the shopping and fashion, at the back the Promenade des Angles, the beach and sea. On the side of the square with the fountain, there is the park, if you are lucky you can find the big Ferris wheel and take a ride to have a look on the city from another angle. This Square is amazing, is one of the best spot to take pictures to post on your social media, during the Carnival, in February take a place a sitting area for watching the parade. Place Massena is not active just during the carnival, but it becomes the main focal point of almost all the biggest events in the city, like during the Christmas time, with the market, stalls and Christmas tree. The fountain in the middle of the square is dedicated to Apollo, the God of the Sun. It’s magnificent and gives to the square the right importance, with the best landscape at the back and beautiful viewpoint of the city centre. You can reach the Cathedral easily. It is along Avenue Jean Médecin, right in the centre of the city. The Cathedral of Notre Dame de Nice is the most important religious building in the whole city. It’s obviously inspired by the most famous Notre Dame de Paris and have the same structure. It is a Roman Catholic Church and is based on a neo-Gothic architecture. This landmark of Nice need to be in your bucket list, it’s FREE, and is something you cannot miss at all, especially if you are in France. You can visit this church Monday to Friday from 8.30 am to 12 pm and from 2.30 pm to 7 pm. The Church is reachable by the Tram 1 at the stop of Jean Médecin. 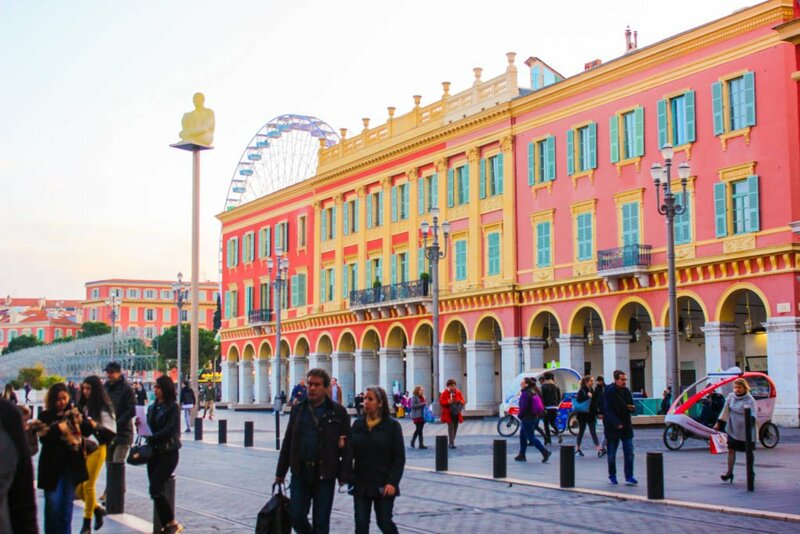 The Promenade des Anglais is the first landmark you see in Nice since your arrival. It’s the waterfront you go along with the bus out of the airport to the city centre. This is one of the best places in Nice, favourite by locals and tourists, you can seat and enjoy the memorable Mediterranean Sea views, there is 7 Km of Coast along the Bay of Angles. Visiting this place, even in which season you are, you can easily understand why is called Côte d’Azur. The colour of the sea in particular, with a lot of blue shadows, going from the light blue to the dark blue. Take a seat and enjoy the colours of Côte d’Azur, just that pay the visit. Yes, it is. You can feel to be in eastern Europe in the presence of this building. It is a religious building and is the largest Russian Orthodox Cathedral in Western Europe. You can see the external part of the building for free, for the internal admission, the fee is 3 euro. This is a good instagrammable spot too and is becoming one of the most visited attractions in Nice. The Cathedral is based and inspired by the Saint Basil’s Cathedral in the Red Square in Moscow. The Cathedral is open from Tuesday to Sunday from 9 am to 12 pm and from 2 pm to 5 pm. Be award to wear strict clothes and no open shoes, keep in your bag something to cover your head to enter. The security guards are strict and if you are not wearing the right dressing code could reject your admission. 5. Matisse Museum, dedicated to the Famous French painter. The admission to the museum is not free, the fee for the visit is 10€, but children under 18 can enter for free. The Museum is located in one of the most ancient parts of the city, in the borough called Cimiez. After the visit to the museum, you can go along the borough and visit the Roman ruins. There are still some Roman ruins, like the arena and the baths. The museum is open every day from 10 am to 6 pm and is close just every Tuesday. Visit the other 5 points. Discover your Nice. For sure you want to visit Nice in summer, everyone wants. Summer is the busiest period. The weather is the best during summer and the prices go up. If you plan to go in July, beard in your mind to plan really in advance, because there is the July Jazz Festival and Nice is full of tourists and lovers of the genre. Nice enjoys a fairly mild climate throughout the year, that gives us the chance to visit it even in December of January. In those months and at the end of November too, you can enjoy the Christmas markets light up, not afford a lot of money for the place to stay and enjoy the weather, not so cold thanks to its Mediterranean position.